The summer before my senior year of high school, I headed off to Cambridge, Mass. to take photography and biochemistry at Harvard. As part of this summer school endeavor, the ole Crimson folks foolishly let anyone in the program who could swim take to the Charles in a boat. This sounded like an excellent idea. I was generally sporty back then -- and a giant -- so I figured I'd take to it like a duck to, well, water (oh, how they make it look so easy in the movies). So, after about 20 minutes in the stationary scull, the kind people at the boathouse noticed my height and let me out onto the river -- alone. The thing they don't point out in the movies is the importance of the wrist action or one's thumbs. A duck in water I wasn't -- maybe wet cement. My wrists were clumsy, my stroke choppy, my thumbs refusing to stay in place. So, after about 10 minutes, I frustratingly ended up sidled against the rocks, thighs bleeding (a result of my slipping thumbs), crying that I'd somehow end up dunked, with Hepatitis and about $30,000 in debt due to a destroyed scull. Eventually, I pulled myself and my act together and finally started to fly. Woah, was it fun. You could try to obtain similar rush (less fraught with blood and tears) in this. Absentee bids start at $200 and it's estimated to go for something in the range of $400 to $600 (much cheaper than the one I thought I'd destroy). Another great bit of decorative rowing memoribilia (sp?) is an oar. I rowed lightweight crew while an undergraduate at Yale, where I came to fully appreciate the sheer aesthetic perfection of rowing. One day our coach asked a group of us if we'd like to have an oar, as Yale was in the process of upgrading (?) 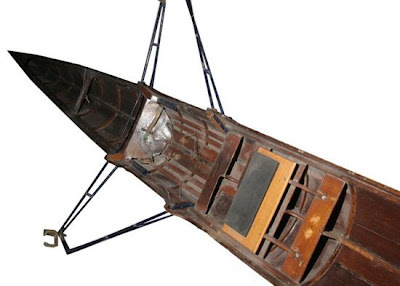 to fiberglass oars from wood, and had extra ones that they no longer wanted. I took him up on it with alacrity, and have carted it around for many years. It has graced many a wall along the way (looks great) and now hangs in my gardening shed where it looks wonderful against the white washed walls among clay pots and gardening ephemera.